Not only do they keep your cats safe from predators -like coyotes -they keep many small creatures alive who could easily become kitty hors d’oeuvres. While chipmunks, squirrels and rabbits are often victims, it’s the wild bird population that is especially hurt by free roaming cats. I always said it was a great cosmic joke. 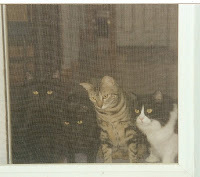 My yard had been landscaped to be a safe haven for birds…and then the kitties arrived. It was clear that something needed to be done. 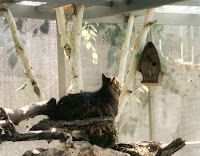 We hung a birdhouse on a tree branch within the enclosure, and Pippen would sit there all day…just hoping. 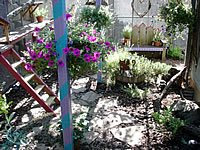 Over the years the kitties have enjoyed many happy hours in their outside playground. However, I often wonder if I have had the better part of the bargain, for watching them playing outside…safely…brings me great joy. There are some things in life we may not be able to impact, but keeping wildlife safe from our dear kitties IS something we can control. By the way – dogs like cat enclosures, too!